Following the recovery of a treasure trove of materials from the decimated Boko Haram, the Federal Government has called on the media and the general public to be vigilant, saying the decimated group has shifted its strategy towards dominating the media space, propagating a perverted version of Shariah law and giving the impression that it is still holding territory. 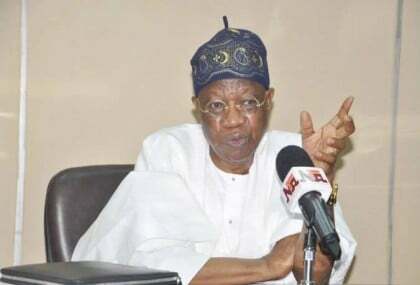 In a statement issued in Abuja on Tuesday, the Minister of Information and Culture, Alhaji Lai Mohammed, therefore appealed to the general public and the media to ensure that they do not unwittingly provide the terrorists with the oxygen of publicity that they desperately need. He said the propaganda strategy was discovered from the materials left behind by Boko Haram Terrorists after they were routed from their last stronghold in Sambisa. ”The materials include documents, phones and computers that contained detailed information on the Boko Haram media and propaganda strategy. An analysis of the materials reveal Boko Haram’s training in videography as well as how they sought and received training from other terrorists groups on video recording and manipulation. ”The documents, written in Arabic, also outlined the media strategy that Boko Haram Commanders should employ and how the surviving members should ensure the propagation of the Boko Haram doctrine using the Social Media,” Alhaji Mohammed said. The Minister said the recovered materials confirmed the announcement of a new media wing called ”Wadi Baya” (Clear Speech) by Boko Haram in an audio released by the group on 17 Jan. 2017, following its routing from Sambisa.